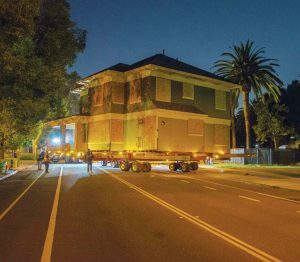 Starting at about 1 a.m. on June 5, Renwick House took a quick trip to its new home on the opposite side of College Avenue, making room for the construction of the new Pomona College Museum of Art. Renwick, which was built in 1900, is now the third stately home on College to have been moved from its original location, joining Sumner House and Seaver House, both of which were moved to Claremont from Pomona. The three-hour Renwick move, however, pales in comparison to the difficulty of the other two. The Sumner move took six weeks in 1901, using rollers drawn by horses. The 10-mile Seaver move, in 1979, took 20 hours.